Container size: 22 feet x 8 feet x 4 feet. Price includes: 6000 lbs, 10 day rental. Here at 20 cubic yard Dumpster Rentals We have been serving the community with affordable and reliable dumpster rental alternatives for many years. 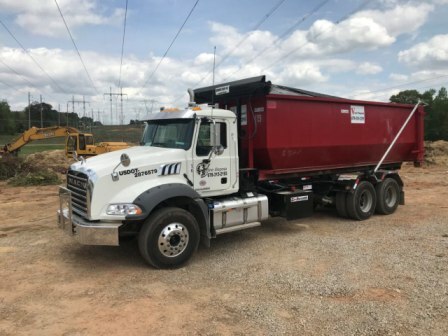 Our commitment to customer service shines through everything that we do, and we are proud to have earned a reputation as of being the most reliable dumpster rental agency in Atlanta, GA. North America. We know your situation. You have suddenly become responsible for a huge amount of trash and you are looking for the most convenient, cost effective way to dispose of it. Perhaps you’ve considered renting a truck and taking it to the dump by yourself, or putting the trash into someone else’s dumpster when no one is looking. Fortunately, you don’t have to rely on those methods. With Roll Off Dumpster Rentals we provide you with cost-effective alternatives to deal with your trash in the most convenient way possible. From the moment you contact us we will work with you to find the most affordable options for your specific needs. Unlike some of the other rental agencies, we don’t take a “one size fits all” approach to your dumpster rental. We find out what you need, when you need it, and how to deliver it to you without asking to throw all your money into the trash can along with the garbage.